The Julie's Greenroom star is advocating for the arts and acceptance alongside her daughter and collaborator, Emma Walton Hamilton, on their Netflix children's show. 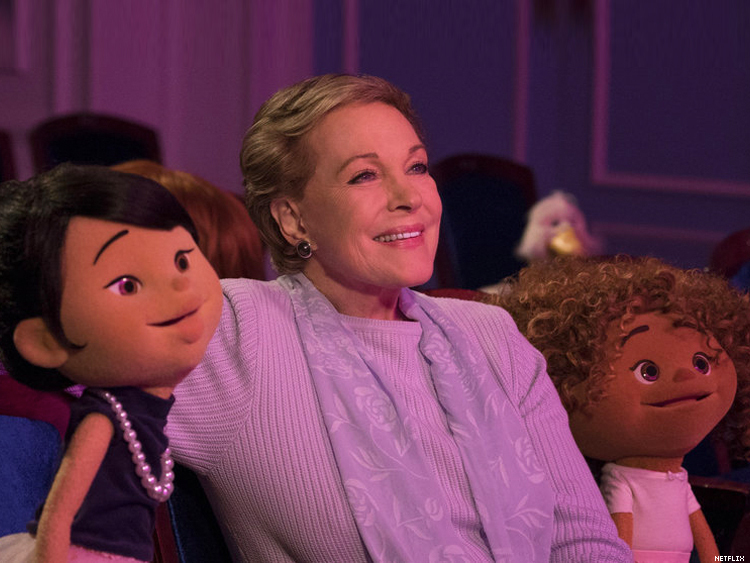 For many years, Julie Andrews dreamed of creating a show with her daughter, Emma Walton Hamilton, which would impart an appreciation of the arts to children. This year she got her wish. The Jim Henson Co., famous for its Muppets, contacted Andrews and asked if she would be interested in partnering for a production with this very concept. Julie’s Greenroom, a new Netflix series, is the fruit of this collaboration. It premiered in March and is now introducing a new generation of young people to the magic of the theater as well as the behind-the-scenes of how it is staged. It’s the latest creative effort from the mother-and-daughter team, who together have written over 30 children’s books and produced several plays at a regional theater cofounded by Walton. The Trump administration infamously threatened to cut the budget of the National Endowment for the Arts. Although the immediate threat to its funding may have passed, Andrews and Hamilton have a message for any political administration that is considering such cuts. “Don’t! Please. Talk to anybody that is passionate about them and listen and learn, because I cannot imagine a world without them,” Andrews said. Hamilton also referenced statistics from the NEA demonstrating the necessity of the arts in improving memory and practical skills like problem-solving. Andrews may be one of the world’s most famous actresses, known for classics like Victor/Victoria, The Sound of Music, and Mary Poppins. But for a moment, this renowned star was upstaged — by one of her show’s puppets. The crew of plush kids created by Jim Henson Company’s Creature Shop included a character, Riley, who is gender-nonbinary, a historic act of LGBT inclusion in children’s television. And how does Hamilton’s nephew feel about the inclusion of Riley? “And also, you know, we have a duck,” said Andrews, referring to Hugo the Duck, a beloved character she created for the show. "The theater never discriminates!" exclaimed Hamilton. Riley’s presence on a children’s show has gained added meaning since the election, which sparked a rise of bullying in schools of LGBT kids. The Trump administration’s rollback of protections for trans students has also left many fearful, leading transgender young people to call lifelines for support in record numbers. Hamilton hopes Julie's Greenroom can send a message to those scared kids. “That goes for just about anybody in this world,” Andrews added. The pair also have a message for lawmakers who are passing transphobic legislation like “bathroom bills," which bars trans people from using restrooms and other facilities that correspond with their gender identity. “Please keep an open mind. Please think,” Andrews pleaded. When asked by The Advocate when the pair first realized they were allies of the LGBT community, Andrews and Hamilton could not respond — for a practically perfect reason. Through Julie’s Greenroom, Andrews and Hamilton wish to give this experience of enlightenment gained through the arts and theatrical productions to a generation of young people. “There’s something for everyone. Even if you don’t sing or you don’t dance or you aren’t necessarily a performer, there is a backstage and there is lighting and set design. And there’s just even being an audience,” said Hamilton. To which Andrews added, “We try to teach good audience etiquette in very subtle ways,” which includes the silencing of electronic devices. In addition to lessons for youth, Andrews and Hamilton hope adults will also learn a thing or two from sharing this viewing experience with their kids. “I think that one of our hopes is that families’ curiosity will be sparked to go explore or perhaps even [visit] their own local regional theater, community theater, or art center,” said Hamilton. Julie’s Greenroom is now streaming on Netflix. Watch the trailer below.